After making set in the previously issues,We will relay control with you. For this, firstly you should receiver module attach to Tinylab and the transmitter module must attach in Xbee adapter. You can upload to this code in tinylab. We need a program for run the application. Can be found here. 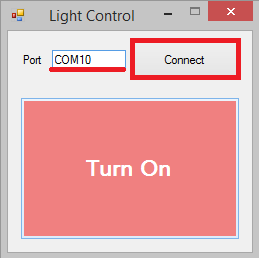 In this program, you should enter COM number near the “PORT” word, which is the XBEE explorer module connecting with your PC, like “COM10”. You dip into this photo. The switch is open when you click to “TURN ON”. After you should follow instructions on the LCD.